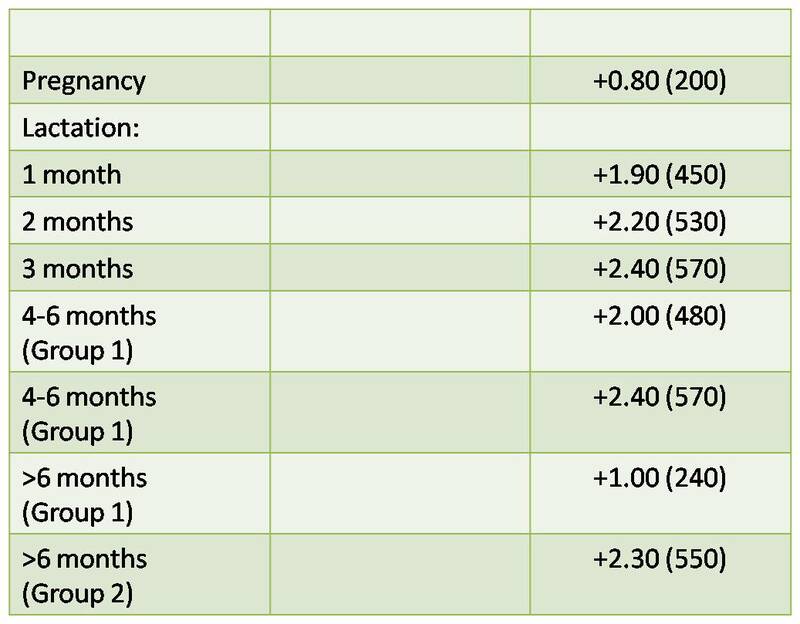 The values shown in the table below are those published in "Dietary Reference Values for Food Energy and Nutrients for the United Kingdom", TSO 1991. In November 2009, the Scientific Advisory Committee on Nutrition (SACN) published new draft guidelines for energy requirements, which are still out for consultation so are not included here. 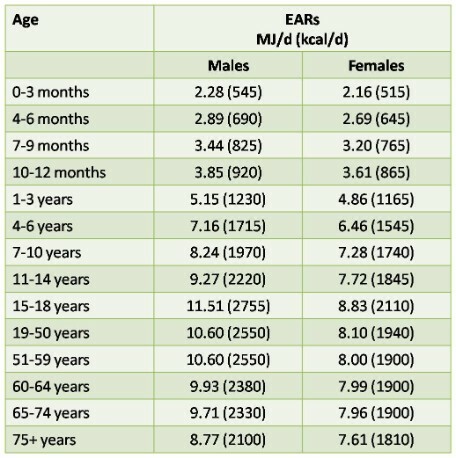 The proposed EAR values in this draft report are generally higher for teenage boys (up to 9%) and girls (up to 15%) and for all adults by up to 16%. For further details please click here. The amount of energy we consume or expend is measured in kilocalories (kcal or Cal). A calorie is the amount of heat required to raise 1 gram of water by 1 degree centigrade. The amount of calories or energy needed per day depends on a number of factors including gender, age and level of activity. Too little energy intake combined with too much expenditure can result in weight loss and even being too thin. Too much energy intake and too little expenditure can result in weight gain and eventually being overweight. Calories are obtained from the MACRONUTRIENTS in foods. Macronutrients are the nutrients we need in fairly large quantities, i.e., carbohydrate, fat, protein; and also from alcohol. Most foods contain a combination of the macronutrients (in differing ratios) and vitamins and minerals (micronutrients). The Calorie has dictated weight management programmes for decades. Energy in and energy expended are without doubt important. However, increasingly, research demonstrates that how a food is used in the body is just as important for weight management and overall health. However, there is evidence to support a deviation from the guidelines. The healthiest and longest lived societies in our world take in about 65% of energy from carbohydrates (but in the form of whole grains, which release sugar slowly into the blood stream); less than 25% from fat; and 10-15% from protein .